As a busy mom, getting dinner on the table can be a challenge. Some days I need easy, I need simple, and I need flavorful. 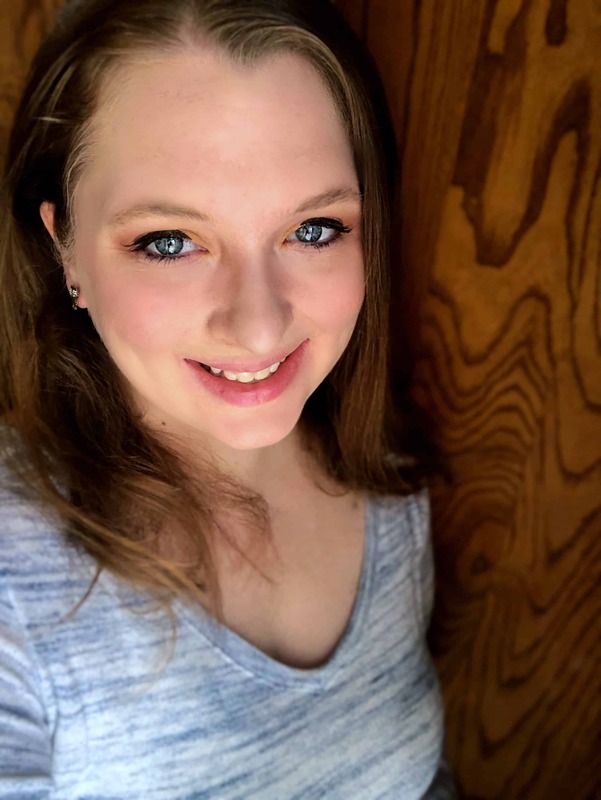 My simple living recipes box includes many of my favorite family recipes, and today I am sharing a recipe that is no exception. 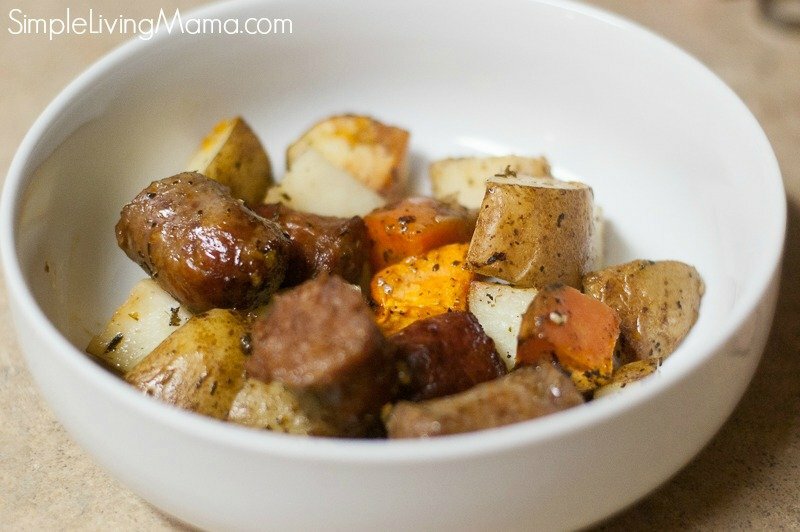 This roasted Italian sausage and potato sheet pan dinner is easy and full of flavor. Bonus, it only requires a little prep and it’s done! 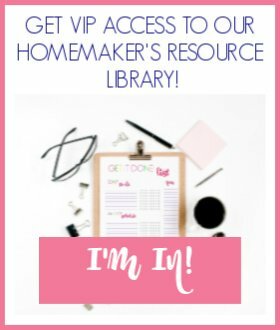 Who wants more easy meals? Check out my Sausage and Peppers Skillet meal or my Skillet BBQ chicken thighs. This sheet pan dinner couldn’t be any more simple. First, you are going to start with your vegetables. 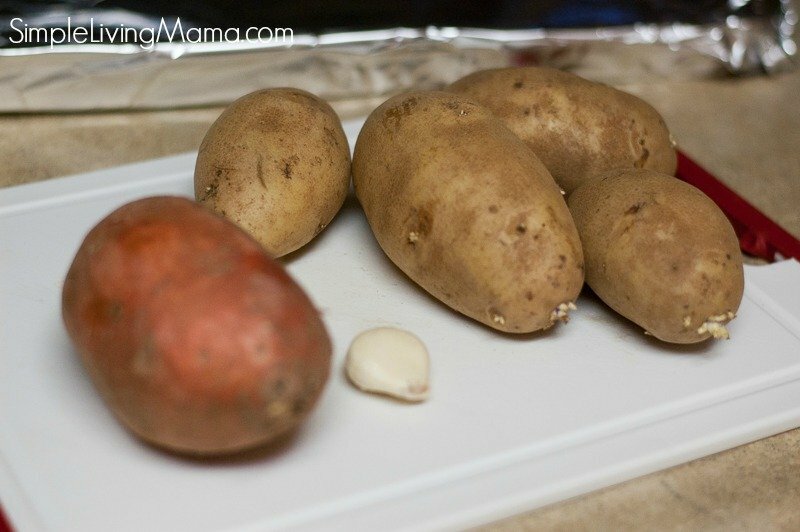 I chose to use russet potatoes, sweet potatoes, and garlic, I would have added some red onion slices if I had them. Chop all of the vegetables into bite sized pieces. Chop Italian sausage links into thirds. Place all of the vegetables into a large bowl. 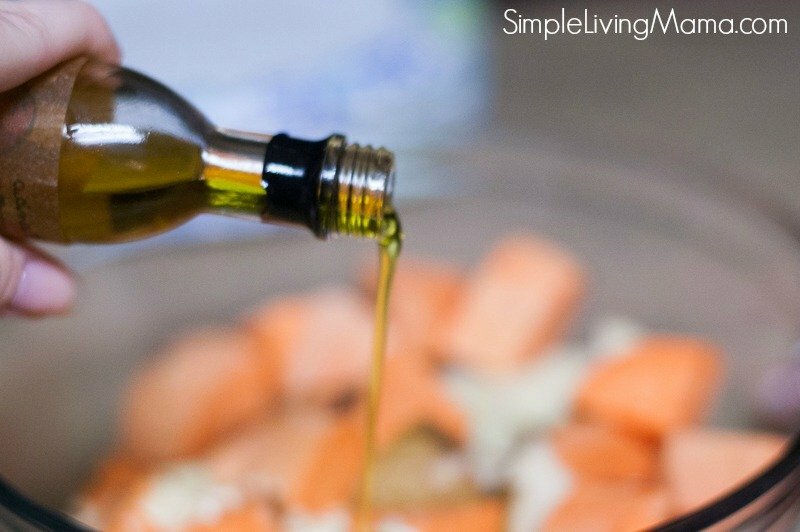 Pour in about a tablespoon of olive oil. Add some salt and pepper and dried Italian herbs. Place everything on a sheet pan in one layer. Bake in a 425 degree oven for about 25 minutes until the veggies are tender and the meat is cooked through. You know what makes this sheet pan dinner even easier? The clean-up! I link my sheet pans with foil, so all I have to do is toss the mess. So, if you’re looking for a meal that is easy to make and full of flavor, you’ll want to keep this one in your back pocket. I enjoy making this on days when we are rushing around and busy and I know I’m not going to have much time to create an elaborate meal. Actually, I’m teaching my daughter how to cook and she can even chop the veggies for me. It’s been so fun having her next to me in the kitchen. Hopefully she will know how to cook all the good things before the day comes and she goes off on her own! 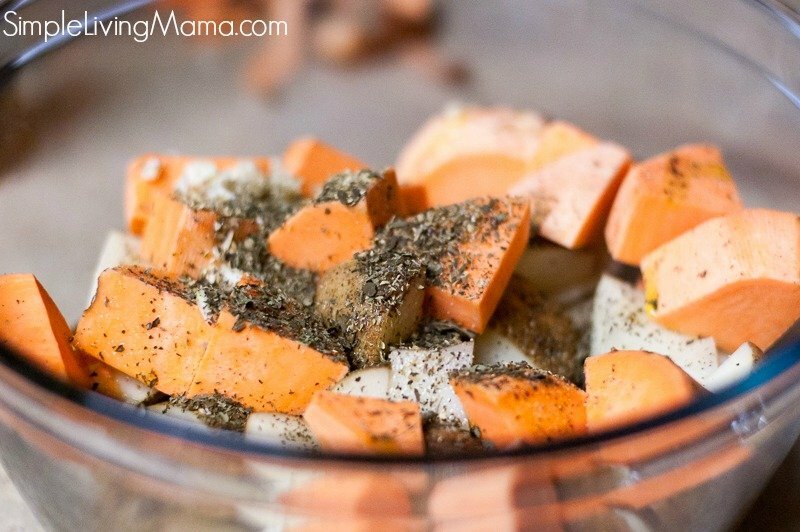 If you liked this recipe, you’ll definitely want to check out my simple living recipes box! 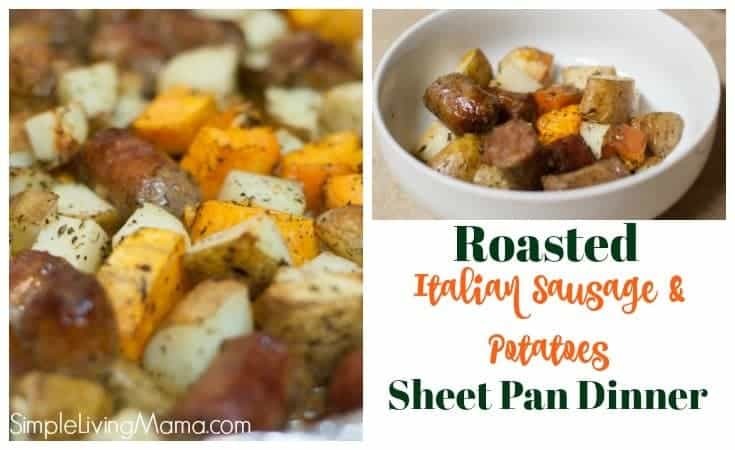 A super easy sheet pan dinner made with Italian sausage and potatoes. 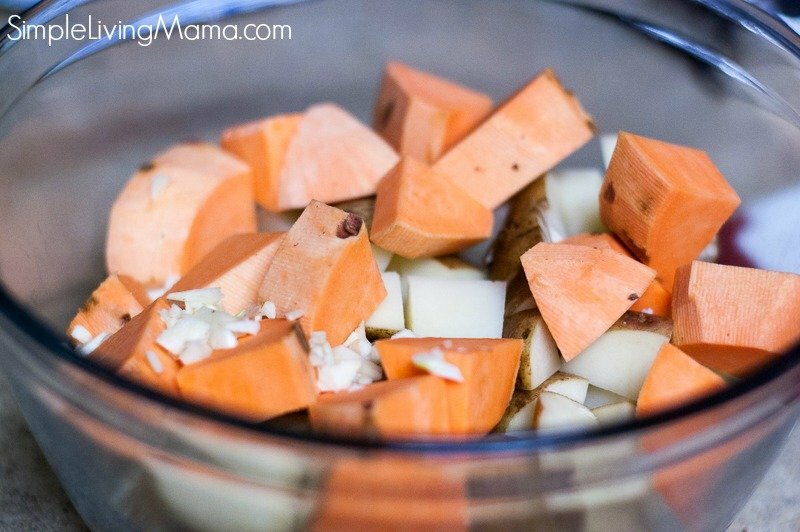 1-2 sweet potatoes, peeled and chopped. 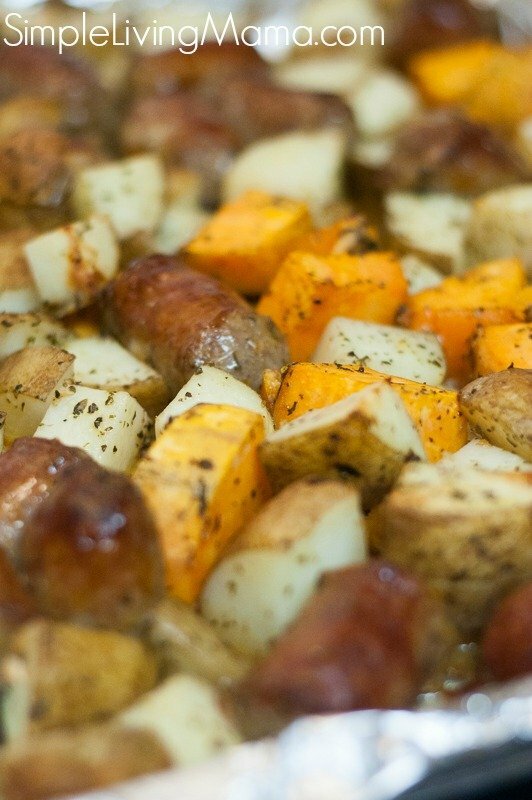 Bake in the oven for 25-30 minutes until veggies are tender and sausages are cooked through.